Ten traditional, Turkish okra cultivars (Batı Trakya, Akköy 41, Kabaklı II, Denizli, Denizli uzun, Bornova (TR-57377 and TR-57420), Amasya Çiçek, Balıkesir T-1, Ağlasun/Burdur) and one commercial cultivar (Sultani/May Seed Company) were selected to represent the variability within domestic okra germplasm from the Anatolian Plateau. Replicated field trials were conducted to evaluate a total of 21 morphological, horticultural and physiological characteristics. Principal component (PC) analysis revealed that first two PC axes explained 49.66% of the total multivariate variation with the first six PC axes explaining 84.23%. The first PC axis separated number of locules, mature pod length and internode length, while the second PC axis separated pod yield/plant, pod number/plant, pedicel length and number of branches. All 21 characters were statistically significant among the cultivars and had at least one high coefficient in at least one of the first six PC axes, which demonstrated that all of them served as distinguishing characters among the cultivars. By using the unweighted pair-group method with arithmetic average four main clusters were consistently formed across all years. The four clusters were also related to the eco-geographic distribution of the cultivars. 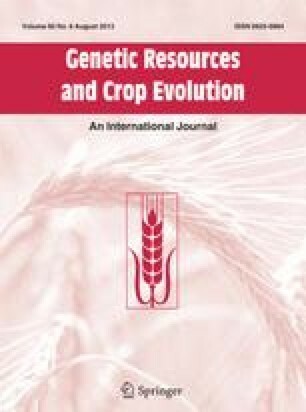 Each cluster members were also described for their main characteristics, which also provide useful criteria for further evaluation of okra germplasm across Turkey.